Nix besonderes. Jeder Mc Donald's Burger schmeckt besser. I liked the burgers and milkshake! wenn man in kalifornien ist und lust auf burger hat, dann ist diese burgerkette mit abstand die beste. alles frisch gekocht, top sauber und es schmeckt perfekt! Every East Coaster has had to listen to their West Coast friends rhapsodize about the famous In N Out Burger. I finally got my chance to experience it for myself in May of 2005. Definitely delicious, and definitely on my list for my next trip out West! 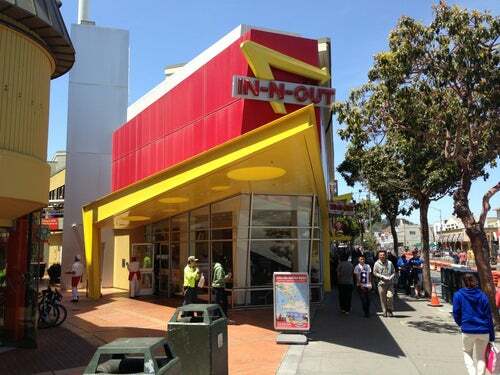 One of California's famous burger chains, In and Out is actually OK for what it is (fast food). The milkshakes are delicious and they have vegetarian options (grilled cheese). Lots of secret menu items.